When i was an academic studying drama, all those years ago, I used to imagine that writers knew what they were doing. Or that they knew what they intended to say. And the job of the vritic or literary investigator was to try to discover what that intention was, and communicate it as clearly and as forcefully as possible. Perhaps all those writers were cleverer than me; but I’ve a feeling we are all probably more or less the same. My preoccupation is always with “tuning in” to the feelings and experiences of the characters, and allowing them to shape and give form to the story. And I’m also becoming an imaginary actor, performing the lines on the stage. And then I’m also being an imaginary audience, making sure what happens is clear. And hopefully entertaining. Then when it comes to the next drafts and the rehearsals, I’m completely obsessed with trying to make sure the lines actually work. None of which actually leaves any room for consciously trying to mean anything. Though when I watch a play I’ve written, I sometimes do get little flashes of what it could be about. If I’m performing, then there’s no room in my mind for any little flashes at all. No flashes during "Queen Jesus". Just the endless struggle to stay connected. So it was lovely to be told by someone in the audience that what shone for her was “genius specialness of being trans” and her pleasure in seeing it communicated “out there in the big wide world”. Because I hadn't quite understood that at the time. But she's right: that is one of the things "The Gospel According To Jesus, Queen of Heaven" is about. 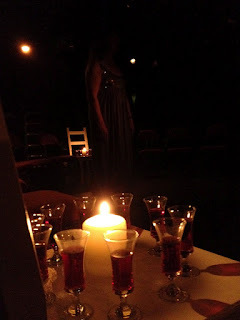 Just as it was lovely to see the rehearsal photos of how we used the space to understand that what our production did was embody the very simple idea that “We’re all in this together: here to love, and to be loved”. Two simple ideas: trans people have something special to give the world; and “We all belong together”. Strange to discover how dangerous they still apparantly are. Obeying an impulse, I put forward the idea of performing“The Gospel According to Jesus Queen of Heaven” in St John’s Church, Edinburgh, as part of the Festival of Spirituality and Peace. The Board have turned the idea down, because it’s “too risky”. “Do thank the board for considering this; do give them my sincere apologies for filling their lives with fear and trembling; do tell them that I. too, am trying to work for a peaceful future; and remind them that Jesus, too, was an extremely risky character.